The Don't Go rapper helped anti-violence campaigner, Adam Fouracre, 25, launch The Stand Against Violence campaign. Adam has been campaigning on the issue of youth violence for over five years after his brother, Lloyd, was beaten to death in Taunton, Somerset by a group of young males in an unprovoked attack just one day before his 18th birthday. He launched the project through O2's Think Big youth programme, with a documentary exploring the devastating impact of his brother's death on his friends and family. 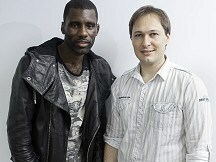 Wretch said: "After seeing the short film Adam made I was extremely touched by it. "I was just thinking as a parent this isn't something I'd like to see my kids go through. It really hit home because of that reason." The 26-year-old rapper hopes young people can learn from watching the film at O2thinkbig.co.uk and pledge to take the Stand Against Violence. Wretch said: "I hope people understand that for every action there is a reaction and a consequence. We all have that second where you want to do something mad, but its about thinking past that second... So I really want people to get their mind in gear and understand there's consequences for their actions." The chart topper from Tottenham - real name Jermain Scott - revealed the recent London riots had moved him to help his community. He said: "I was watching the news thinking 'London looks like it's in trouble man'. It was crazy. "But I was more focused on what I could do to help rebuild my community. So I came back and donated some time and some clothes."